It seems that some time ago my site was hacked. I think I've removed the offending bits, but until I'm sure, surf at your own risk. It seemed to be a bit of malware that would redirect you to another site that would try and tell you your browser was at risk and insist that you enter a user name and call a toll-free number. All of which is complete nonsense. If you encounter anything like that while at this site, and you happen to know me, please contact me and let me know. Also, if you're in Windows, you may have to open your task manager to force quit your browser. Never respond to any kind of nonsense requests like user names, phone calls or passwords from this site. I'm sorry if this has affected anyone. With summer entering it's last weeks, fresh tomatoes are plentiful. Turning ripe tomatoes into a cold soup for these hot days is a sure winner. If you can, visit a local farmer's market and get the ugly tomatoes. Trust me. Heirloom tomatoes may be misshapen and have split tops, but they have the best flavor. Sometimes you can find nearly over-ripe tomatoes at a discount. If so, grab them up. They're perfect for this soup. 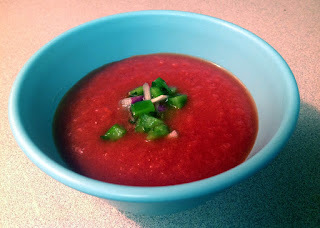 Inspired by a recipe by David Tanis, this chilled soup is a winner. I served it will grilled cheese sandwiches and it made a very nice, light, meal. Toast with avocado would be a nice accompaniment, as well. 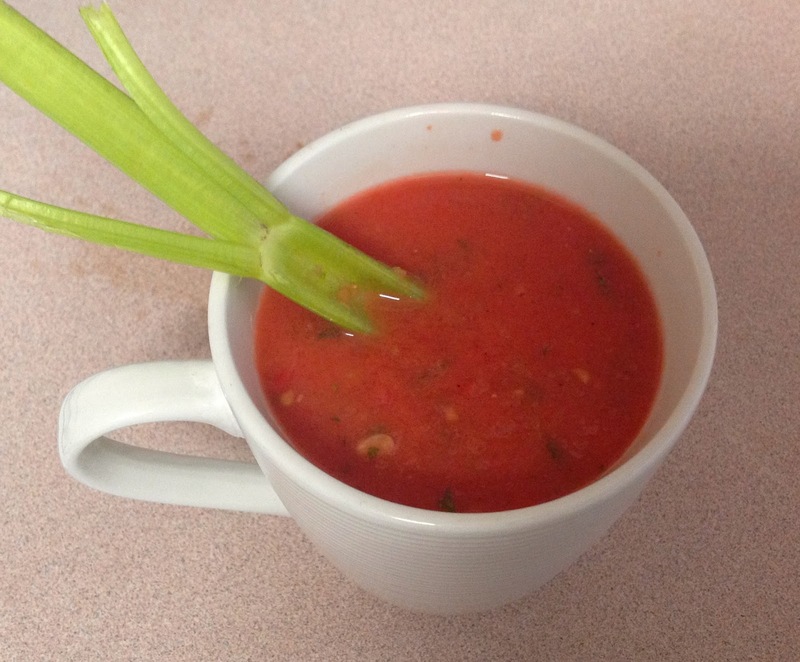 If you can't get good, fresh tomatoes, this soup also works well with canned tomatoes. Use a 24 oz can, with juice. Take about 1 hour, including time to chill. Put all of the soup ingredients (not the garnish!) in a blender and blend on high speed for 1 minute or until very smooth. Add more salt, pepper, and cayenne, if needed to taste. Put in a non-reactive bowl and chill for one hour or more. About thirty minutes before serving, mix the ingredients for the garnish together, and refrigerate until needed. To serve, divide soup evenly between four bowls, and place about 2 Tbl of garnish in the middle. In the midst of a heat wave the last thing I want to do is turn on my oven. Second only in kitchen aversion is using my stove. We don't have central AC in this tiny apartment, and so turning on the oven is akin to turning the entire kitchen into a sauna, and not the good kind. The ambient heat, having sapped my will to live, has come into conflict with my gluttonous desire to eat good food. Cold food is a must for these steamy days. Fortunately, both tomatoes and watermelon are in season. Tomato and watermelon are surprisingly good together. This recipe, based on one by Anya von Brezmen, is surprisingly sparse on ingredients, for a gazpacho, but is perfect for hot summer nights. I think it works better as an appetizer, or aperitif, but it can pass as a light supper when served with cold sandwiches. Make sure you get fresh, juicy melons and tomatoes for this dish, and don't forget the celery. It's heightens the flavors and really brings things together. Don't worry, my friends. Flavorful refreshment is on the way. Takes 10 minutes to make, and at least 2 more hours to chill. Working batches, puree all of the ingredients except the garnish in a blender for at least two minutes, until smooth and frothy. Taste and adjust seasonings, adding more salt, pepper, and lemon juice as needed to make the flavor pop. Transfer to a bowl and chill for at least 2 hours, and up to 24 hours. Serve in individual bowls or mugs, garnishing with celery sticks. If there are any leftovers, which there probably won't be, they'll keep in the refrigerator for up to 3 days.